Something exceptional, dynamic, provocative and mind blowing! 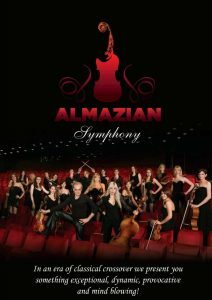 Almazian Symphony is an international instrumental ensemble composed of a 100% female orchestra with a male soloist, performing in Classical Crossover style . Founded by the Armenian-Belgian violinist Khachatur Almazian and the Serbian-Belgian cellist Tamara Savic, the ensemble immediately attracted huge media interest. The first performance was praised by all major Serbian media. The Serbian Press titled the project as « New classic for the new Millennium ».